SCIENTIFIC Marxism. The totalitarians at JCU destroying the meaning, value and relevance of ‘science’ in the name of global warming groupthink and government grants. Andrew Bolt has an excellent piece on the Peter Ridd sacking, well worth a watch. 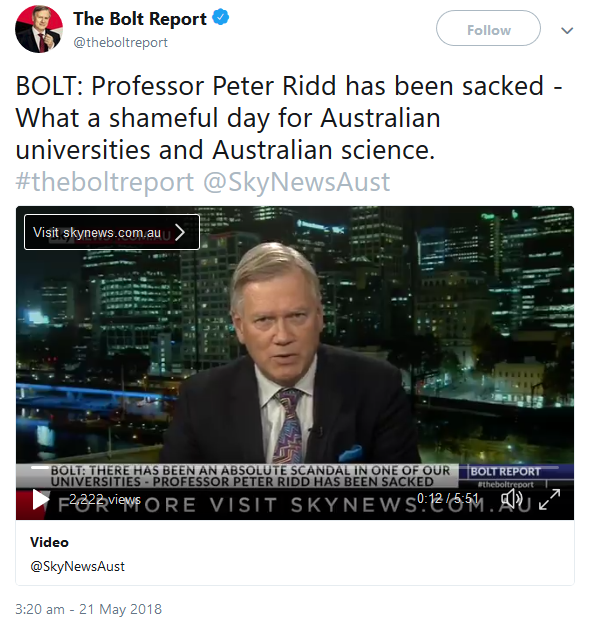 As well as the specific issue here, he highlights that this is part of a much wider trend in Australian universities, recalling the sacking of Bob Carter for daring to question global warming dogma. He could also have mentioned Murry Salby. “EARTH DAY” 22nd of April. Also the Birthday of Russian communist revolutionary Vladimir Lenin. Obviously rather fitting with the motives and parallels between the “climate change” ideology and the totalitarian intent of dictator Lenin, far too intertwined to be a coincidence! In the May 2000 issue of Reason Magazine, award-winning science correspondent Ronald Bailey wrote an excellent article titled “Earth Day, Then and Now” to provide some historical perspective on the 30th anniversary of Earth Day. In that article, Bailey noted that around the time of the first Earth Day in 1970, and in the years following, there was a “torrent of apocalyptic predictions” and many of those predictions were featured in his Reason article. Well, it’s now the 48th anniversary of Earth Day, and a good time to ask the question again that Bailey asked 18 years ago: How accurate were the predictions made around the time of the first Earth Day in 1970? The answer: “The prophets of doom were not simply wrong, but spectacularly wrong,” according to Bailey. 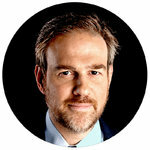 WHEN the New York Times hired climate ‘Lukewarmer’ Bret Stephens as a contributing columnist in late April 2017, a collective cry of treasonous rage was heard throughout the deep-green environmental community. How dare anyone question whether we should accept absolutely every pronouncement of imminent eco-doom at face value?! A New York Times defence of its hiring of a climate science denialist as a leading columnist is pushing high-profile climate scientists to cancel their subscriptions. Professor Stefan Rahmstorf, of the Potsdam Institute for Climate Impacts Research in Germany, is the latest scientist to write publicly to the New York Times detailing his reasons for cancelling their subscriptions. The NYT has hired former Wall Street Journal columnist Bret Stephens as a writer and deputy editorial page editor. Stephens wrote several columns while at the WSJ disparaging climate science and climate scientists, which he has collectively described as a “religion” while claiming rising temeperatures may be natural. The NYT has been defending its decision publicly, saying that “millions of people” agree with Stephens on climate science and just because their readers don’t like his opinions, that doesn’t mean they shouldn’t be heard. But the NYT defence has angered scientists. The Gray Lady’s newest hire used his debut column to defend his record of climate science denial. Even the Times’ own reporters publicly questioned the hire. STEPEHENS has recently written another reasoned column in the Times that has no doubt sent the eco-freaks into another predictable tailspin! IN the Feb 8 opinion piece, “Apocalypse Not“, Stephens argues that a healthy environment is dependent on a healthy economy first, namely a capitalist one. A view not shared by radical environmental groups who, including the UN, believe that in order to “save the planet” we must fundamentally change the current economic development model. Christiana Figueres, executive secretary of the UN’s Framework on Climate Change (UNFCCC) herself admitted that the goal of environmentalists is to destroy capitalism. GLOBAL Warming theory has long abandoned any connection it has with actual science. It is has become as ideology. A new religion. Australia’s former Prime Minister Tony Abbott likening it to, “socialism masquerading as environmentalism“. Call it yet another case of Apocalypse Not. In our own day, people like Bill McKibben and Naomi Klein have made careers saying more or less the same thing. This is a world where the clock is permanently set at two minutes to midnight, and where only a radical transformation of modern society (usually combining dramatic changes in personal behavior along with a heavy dose of state intervention) can save us. The foolish idea that capitalism is the enemy of the environment misses the point that environmentalism is itself a luxury that few poor countries can adequately afford. If you doubt this, contrast the air and water quality in New York City with that of any similar-sized city in the developing world. I fall in the Borlaugian camp. That’s worth noting because one of the more tedious criticisms by the environmental left is that people like me “don’t care about the environment.” But imputing bad faith, stupidity or greed is always a lousy argument. Even conservatives want their children to breathe. Borlaugians are environmentalists, too. They simply think the road to salvation lies not through making do with less, but rather through innovation and the conditions in which innovation tends to flourish, greater affluence and individual freedom most of all. If environmental alarmists ever wonder why more people haven’t come around to their way of thinking, it isn’t because people like me occasionally voice doubts in newspaper op-eds. It’s because too many past predictions of imminent disaster didn’t come to pass. Hopefully, those global warming doubters in Florida watching frozen iguanas falling stiff from the trees now know that while they were freezing, according to Australia’s Bureau of Meteorology, little old Penrith in Sydney, Australia, was the warmest spot on the planet, recording its highest temperature ever, having “broken the all-time maximum temperature record for … the Sydney metropolitan area”. In a hurried piece in Fairfax publications, the Climate Council of Australia’s Will Steffen throws hot water on any misconceptions that may have been drawn from abnormal snowfalls in Britain, Switzerland and Japan, the record-breaking cold snap in Canada and the US, and the expansion of the East Antarctic Ice Sheet. He says: “Terms like ‘global warming’ and the mental images they trigger can be misleading when people attempt to understand what is happening to the climate. A far better term is ‘climate disruption’, which captures the real nature of the vast array of changes, many of them abrupt and unexpected, that are occurring.” So fire and ice, it’s to be expected. On the day Steffen’s opinion piece appeared, this newspaper republished Matt Ridley’s article in The Times claiming “the Earth is very slowly slipping back into a proper ice age”. This confirms research by Henrik Svensmark, Australia’s David Evans and others, who correlated low solar activity (fewer sunspots) and increased cloud cover (as modulated by cosmic rays), with a cooling climate. Steffen’s work could fit this description. He spends much time pushing eco-catastrophism. “Climate disruption” he says “brings growing risks of large-scale migration and conflict as people, particularly the most vulnerable, are forced to deal with increasingly difficult conditions where they live. Some security analysts warn that climate disruption will dwarf terrorism and other conventional threats if present trends continue or worsen. But where would manmade global warming “science” be if it relied on just facts? For decades, climate science has been plagued by scandals, deceit and the confessions of whistleblowers. Penrith’s hyped recording is not new. Scientist and long-time BOM critic Jennifer Marohasy has been calling for an audit and urging Energy and Environment Minister Josh Frydenberg “to inform the World Meteorological Organisation that the temperatures recorded by our bureau are not consistent with calibration, nor any international standard”, and, to “direct the bureau to desist from announcing new record hot days”. But despite their best efforts, in the public’s eyes their story is wearing thin. There have been too many false predictions and unwarranted alarmism. People are wising up to the reality that climate science has become an unfalsifiable ideology and resent having their moral conscience questioned should they disagree. To survive such an event, our successors will need a plentiful supply of cheap, reliable energy, impossible given today’s intelligentsia’s religious objection to low-cost fossil and nuclear fuels. It’s not carbon dioxide that threatens us with extinction but blind ideology dressed up as science. RATHER telling when the likes of the Guardian lambasts China’s absurd move to ramp up coal-fired power to ensure the wellbeing of their most vulnerable, demonising “dirty” (lifesaving) coal without a single mention of unreliables to stop the supposed rot. Cowards. Oh, the joys of central planning! BEIJING (Reuters) – China has urged coal miners to increase high-grade coal supplies to ensure heating fuel for winter, the National Development and Reform Commission (NDRC) said in a statement on Tuesday. The statement comes after the central government scaled back its plan earlier this month to convert northern cities to natural gas from coal for heating, because provinces across China had warned of gas shortages. The NDRC asked miners to put more high-grade coal projects into operation “as soon as possible”. Coal-fired power plants are also encouraged to increase their thermal coal stockpiles and upgrade their equipment to reduce emissions.